28th Tokyo International Film Festival | “Yowamushi Chinsengumi” (a.k.a. Cowardly samurai squad) has been selected for the 28th Tokyo International Film Festival screening! Home > News > “Yowamushi Chinsengumi” (a.k.a. Cowardly samurai squad) has been selected for the 28th Tokyo International Film Festival screening! “Yowamushi Chinsengumi” (a.k.a. Cowardly samurai squad) has been selected for the 28th Tokyo International Film Festival screening! The rare 1935 cartoon short (5 min.) “Yowamushi Chinsengumi” (1935) directed by the renowned film director, Kon Ichikawa, will be screened during the commemoration of the 100th anniversary of the birth of Kon Ichikawa. The film was recently discovered in United States and was archived by Academy of Motion Picture Arts and Sciences and is currently stored at the University of California, Los Angeles. 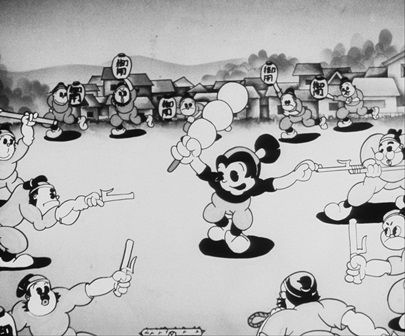 Kon Ichikawa was known to adore the Disney animations and aspired to become an animator. This is a valuable film to explore the fundaments of his filmmaking techniques. Long-lost animation film by Kon Ichikawa and others discovered last year in the US. This is the third episode in Hana Yori Dango series. The story of Dangonosuke, a boy samurai rescuing a woman from a villain is told comically.